Troll Lords has been putting out some quality products since the 3.x/d20 boom days. This includes not only their own "house" system, Castles and Crusades but also some 3.x material back in the day. Well now they are dipping their toes into 5th edition and I could not more pleased. This past Gen Con I picked up their 5th edition version of their adventure A3 The Wicked Cauldron. I already had the C&C version and I wanted to see how they compared. Especially since D&D 5 really has a lot of ideas that C&C started with. The Castles & Crusades version is 24 pages and designed for 3-5 characters of 3rd to 4th level. The Dungeons & Dragons 5e version is 40 pages (larger font) and for 3-5 characters of 3rd to 5th level. I am reviewing the print and pdf versions. The premise is a fairly simple one. There is a ruined ziggurat in the Barren Woods that is the home to many foul things. It also has a long and evil history and currently is home to one of the fabled Witch Queens. The PCs must investigate and stop her. The adventure itself is particularly original, but that doesn't make it less fun. There is a good balance of overland and dungeon exploring, plenty of new monsters to fight, a threat of an ancient evil. Given that this module is coded "A3" should give you an indication it is part of a larger series, and it is. It can be played as part of Troll Lords "A" series that began with "Assault on Blacktooth Ridge" and "Slag Heap" and continues in other Airhde products and adventures. But it can also be played as a stand-alone adventure. The adventure is very reminiscent of the old Basic adventures of the early 80s, especially B2 and B4. In fact, it is almost a perfect mix of these two classic adventures. So in the nostalgia department, it gets a perfect score from me. My biggest issue with the PDFs and the Print versions are the maps are fairly small. I can redo them on my own and larger, but having something I can print out or read easier would be nice. 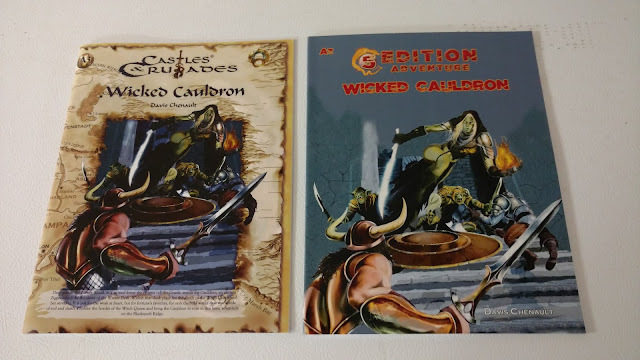 The 5th edition conversion is good and really, C&C is so close to D&D5 as to almost make the conversion unnecessary, but still I did enjoy looking through both to find the subtle differences. The most interesting changes were to the Witch Queen herself. The Witch Queen, Neb–Eprethat, is the central figure in this adventure and stopping her is the main goal. In the C&C version, she is a Lawful Evil 5th level human cleric/wizard. In the D&D 5 version, she is a Chaotic Evil 6th level human cleric. In both cases, she could be better served as a witch. There is no D&D5 witch class (yet) and I am not ready to publically reveal my C&C witch class. But I can give her a try in my Basic-era Witch. Though given that she supposedly worships and honors the "Horned One" she could be a D&D5 Warlock too. In fact a warlock (as per D&D5) makes a lot of sense. She joins the ranks of the other Witch Queens that I have been gathering. Can't wait to run this under my War of the Witch Queens campaign.